Sammons Reusable Drinking Straws are latexFree and 18 inch long straws that come in two varieties, flexible polyethylene and rigid Plexiglas. 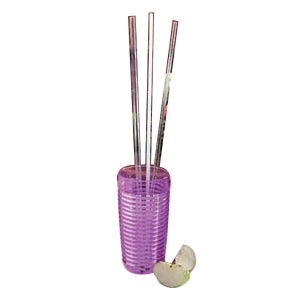 The 1/8 inch and 1/4 inch diameter, rigid straws can be heated with a heat gun and reshaped as desired. The rigid 1/4 inch diameter straw is ideal for soups. The flexible polyethylene straw comes with a 3/16 inch diameter hole.